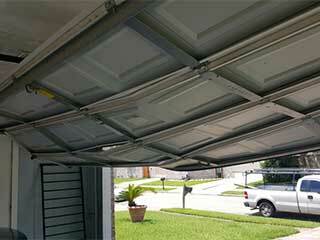 Regular garage door maintenance is an excellent way to make sure this section of your home stays safe and secure. There are a number of things that can go wrong with your system, but when you have our technicians service your garage door, you can avoid a lot of the major problems. It's important that the weather-stripping of your garage door is in a good condition. The door's side and bottom seals are in charge of not only preventing water, snow and various pests from finding their way into your home, but also to insulate your garage and help you maintain your desired indoor temperature. Over time, your weather-stripping can wear away without you realizing it. One of the things our technicians always check during our garage door maintenance appointments is the condition of these seals. We'll replace them on the spot if they prove to be too worn or damaged necessary. Your garage door torsion springs need to be lubricated routinely in order to ensure their smooth performance. Your rollers, if you have steel ones at least, could use the same treatment. If you have a chain-drive opener, then our technicians will lubricate the chain as well, and make sure it's adjusted correctly. No matter how recently your garage door opener was installed, there is always a risk of an electrical fire. This can happen because the wires were not connected correctly, or because something has come loose in the opener. We will make sure to open up the unit and inspect the wiring to keep you and your family safe. At Garage Door Repair Newcastle, we understand that it can be difficult to stay on top of every aspect of your home that requires regular maintenance, which is why our team of experts is happy to provide you with this service. Schedule an appointment today.